Police say reality TV star Luann de Lesseps made threats and was arrested on multiple charges. A star of the reality television series "The Real Housewives of New York City" apologized Sunday after she was arrested in Florida, saying her visit to exclusive Palm Beach brought up "long-buried emotions." 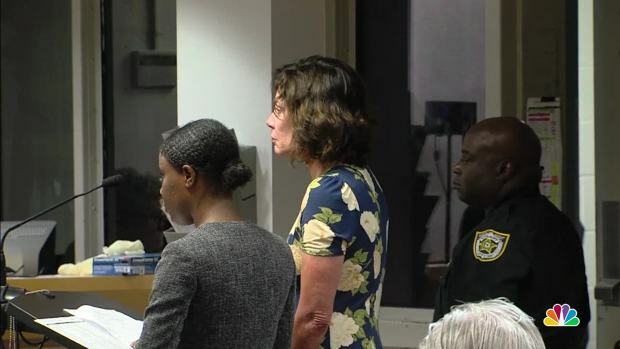 Palm Beach County court records show 52-year-old Luann de Lesseps was booked Sunday on charges of battery on a law enforcement officer, resisting arrest with violence, disorderly intoxication and corruption by threat. De Lesseps, who lives in Sag Harbor, New York, was released on her own recognizance, according to jail records. Her next court appearance is scheduled Jan. 25. Luann de Lesseps, a star of the reality television series "The Real Housewives of New York City," is seen in court after her arrest in Palm Beach, Florida. A prosecutor said de Lesseps "slammed a door on an officer's face" and threatened to kill them before she was arrested. The circumstances of de Lesseps' arrest late Saturday in Palm Beach were not immediately available. The Palm Beach Post reported that a prosecutor said de Lesseps slammed a door and kicked at least one police officer, and she made threatening comments before she was arrested. In a statement emailed by her spokesman Pete Sanders, de Lesseps offered her sincere apologies to anyone she might have offended with her behavior. "This was my first time in Palm Beach since my wedding and being there brought up long-buried emotions," she said. She said she was committed to a "transformative and hopeful 2018." De Lesseps married Tom D'Agostino Jr. in Palm Beach on New Year's Eve. The couple split earlier this year. Messages left Sunday morning for a Palm Beach Police spokesman were not immediately returned.